I took my daughter to the grocery store on Saturday, through a bit of reluctance and dismay. Teenagers like to eat and they like to shop, but they do not like to shop for what they eat. Then again, neither do I, but I digress…. A third of the way through the store, she’d had enough. She jumped on the front of the grocery cart and perched herself on the front edge of the wagon, sitting so she had a bird’s eye view of where we were going, but I definitely did not. In each aisle, I struggled with the steering challenge involved when 95-ish pounds perches itself at the very front of the cart. There is no going around corners in a quick and efficient manner. As I carefully steered around other shoppers, we attracted stares from curious children who contemplated my daughter’s seat on the cart. Perhaps they thought what she was doing looked awesome, but clearly weren’t sure it was something a kid should be doing. I cringed and turned the cart in the other direction, trying not avoid locking eyes with their parents, the ones who likely would not approve of a teenager—even a small one—riding around the store perched on the front of a grocery cart. But then we turned into aisle 9. We passed two men shopping together; they looked to be around 30, I would say. One was pushing the cart when he noticed my daughter. “Oh,” he feigned surprise, his face remaining dead serious—almost disgusted. “I didn’t know we could ride on the wagon.” He looked at his friend. “Hop on!” He commanded, and his friend—easily twice the size of my daughter—assumed a position on the front of their cart. They took off down the aisle. 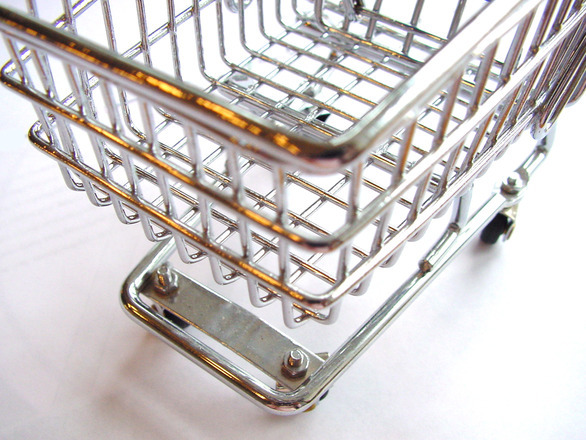 “We’re going to race you in aisle 12!” the cart pusher called out over his shoulder. “That gives us a couple of aisles to practice!” The two men careened around the corner and were gone. For a split second, the competitive impulse in me was awakened, and I wondered if my daughter and I could really beat these men in a race down aisle 12. And then I snapped out of it. This was the supermarket on a Saturday. There was no way aisle 12 would be clear enough for shopping, never mind a race. I sighed, abandoning my reverie, and put some muscle into pushing my cumbersome cart. Yet in that ten second interchange, an otherwise ordinary grocery trip had been transformed. My mood had lightened, and I had a renewed sense of fun. Maybe I would meet up with these two in aisle 12… if not today, maybe another day! It was a crazy week in my life. I have to say my life because it wasn’t specific to my house. It wasn’t focused on my family. It wasn’t only at work. It was my life. Everything I touched became completely crazy. I could say that I encountered some bumps on my journey this week, or I could say that a mountain appeared on the path in front of me. I prefer to think of it as some minor speed bumps designed to get me to slow down. To reevaluate. So I slowed down, and I used this week to gather some lessons to share. The good, the bad, and the silly. You don’t have to stay positive, but it will certainly make the tough times more pleasant. All of us, in our lives, will encounter a bumpy road every now and then. As I look back on my week, I am picturing a child on a bike, hair blowing back with the speed of travel, feet off the pedals, legs outstretched, and a gleeful smile on her face. Staying positive will help you make the most of the moment. You might be presented with a hill or a mountain or a sheer rock face, but believe in yourself. Whatever happens, life goes on. Put one foot in front of the other and keep moving. Sometimes, cookies will take the edge off. 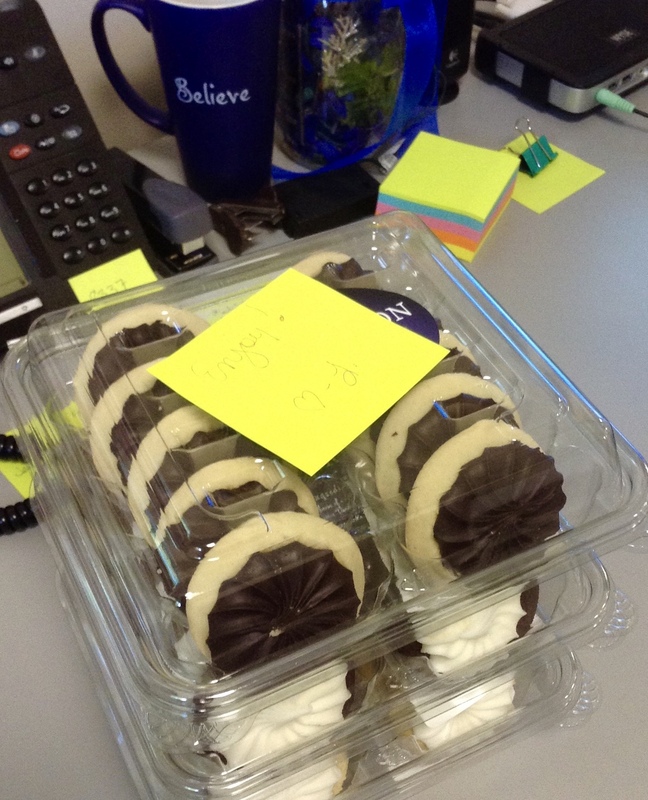 When one of my coworkers called and asked what she could do to help, without a second’s hesitation, I joked, “Cookies! We need cookies!” I arrived the next morning, and on my desk I found—you guessed it—cookies! If you don’t occasionally put your own needs first, you will be useless to those around you. This is a lesson that I am constantly struggling with. It seems I spend my days addressing the needs of everyone around me, but when it comes to simple things like sleep, deep thinking, relaxation, etc., I don’t make myself a priority. Here’s the thing about hills… you can’t see through them. Things may well be more beautiful on the other side. Once all the crazy, negative energy settles, we will see where we are. I am going to keep climbing and see where life takes me. At least I can enjoy the view along the way! No matter what happens, you are not alone. There will be people who will offer to climb with you. Sometimes, they might simply walk by your side and keep you company; sometimes, they might carry you. Take them up on their offer. Life is better when you share the trials as well as the triumphs. Oh… and bring the cookies. They might come in handy! I have smiley faces all over my house. I know where they are, but they are invisible to the untrained eye…. This weekend, my daughter and I decided to make a bold change in our living room. Since we moved in, the walls in the room have been a very pale yellow, the color of butter. The choice was made in part because the room is small and north-facing. It gets minimal daylight through the French doors, so I was looking for a light, sunny color to compensate. This weekend, we made a long overdue change. Together, we decided on a forest-y green with one darker accent wall. For whatever reason, we started with the accent wall, making the most dramatic change first. Here’s what I love about painting with my daughter. Before she begins to paint, she takes the edge of her paint-laden roller to the wall, using the blank space as her personal canvas. 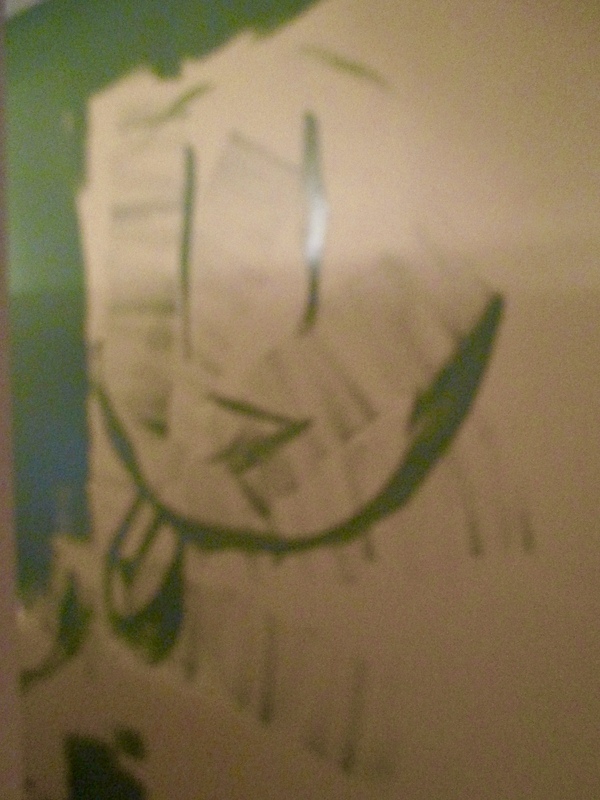 In the midst of the old color, there appears a smiling face of the new color, and she continues her walk to the corner to begin covering the entire wall. The image sticks with me. Now, every time I look at a finished wall—this one or several others in my house—I can see the face, smiling out at me. The number of walls in my house with smiley faces is growing. The number of rooms with hidden smiles… it’s growing, too! It’s nice to know I have smiley faces watching over me throughout my house. It gives each room a positive vibe. Perhaps if you come to visit, you might even be able to figure out where the faces are hiding! By a stroke of pure, dumb luck, college drop off for my son dovetailed beautifully with a weekend camp program we typically attend as a family. While it was unlucky that my college son would not be able to join us at camp, it was lucky that I wouldn’t be spending the weekend at home, where his absence would be most pronounced. A weekend at home would mean I would notice that that house was one quarter less full… that there was an empty bed… that the food wasn’t disappearing from the house as if being consumed by a powerful vacuum. Instead, I would be away, occupied by (most of) my family and some long time friends. 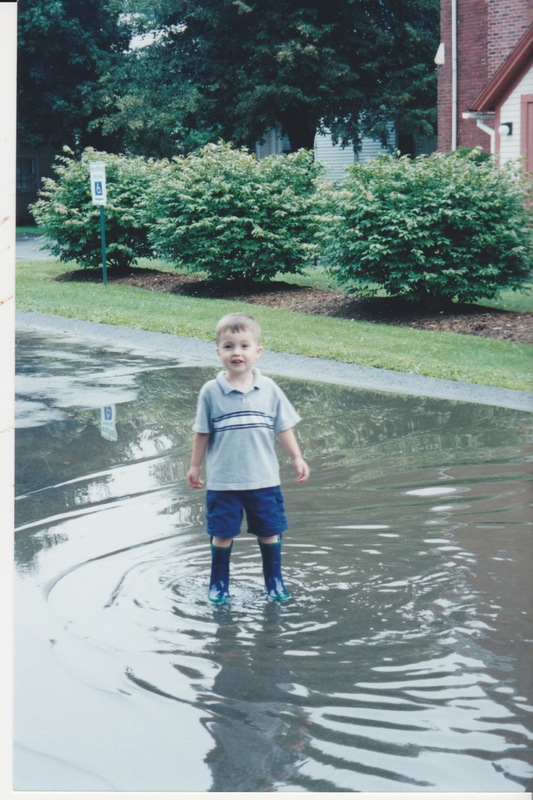 Even away from home, I found myself frequently wondering what my son was doing, who he was with, and how he was navigating his new life in the college environment. Camp was merely a partial distraction, but my son was still in the forefront of my mind. 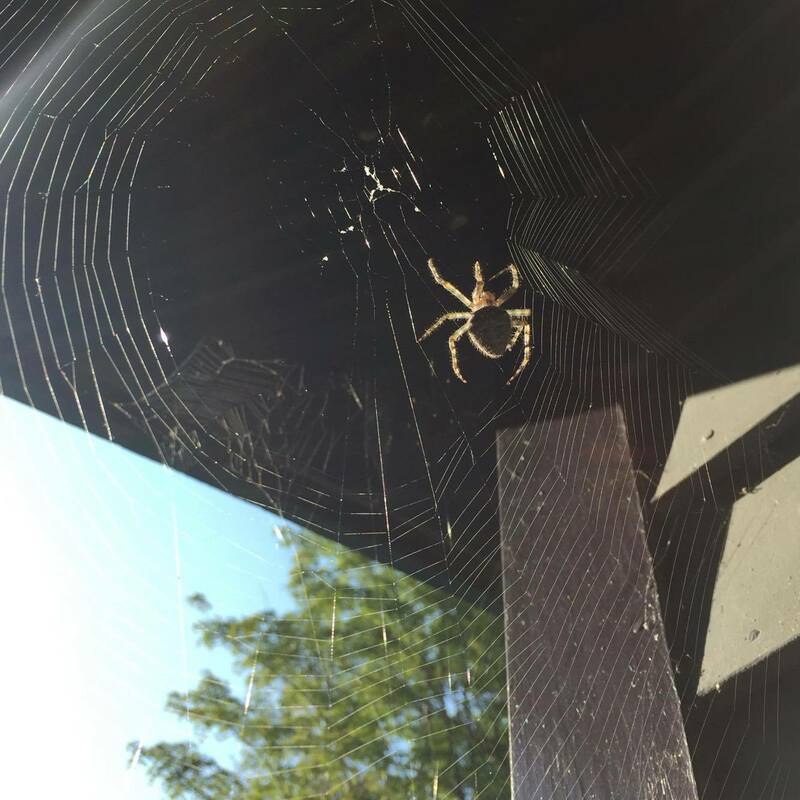 On the second morning, as we slogged out of the dining hall after breakfast, the sun caught the shape of an incredibly industrious spider crafting a web in the corner of a small alcove near the doorway. The creature was quite large and conspicuous. Had it fallen on someone, there is no doubt a scream fest would ensue. A small group of us stood transfixed, watching the spider spin its web, carefully attaching silk strands one to another as it wove its deadly trap. It was working on the center of the web, maybe a repair from a recent struggle—there was no question this spider had been eating well in order to achieve its current size. As I watched the spider, a thought began to creep into my head, eclipsing—no! joining with the thoughts of my son. This spider would make the perfect dorm pet! After all, there were rules against four-legged pets, but the students could have fish. Why not a spider? A spider would live peacefully in his room, right over his bed, taking care of all the tiny bugs that enter the room. A spider would not take up much room; it would live quietly, weaving webs in the corner over his bed, repairing its web and possibly making it bigger each night. Eventually, the web might interfere with the bed, but by then, my son would be used sharing his space with his unusual pet…. Yes, these thoughts did enter my mind as I watched the spider weave its tangled web, pulling me in to its weaving. For a brief moment, I thought about how very much my son loves spiders (or… not). And how he might be perceived by his dorm mates if he kept a pet such as this in his room. And then I turned and walked away. Because even though bringing this spider to my son is humorous in theory (or maybe just in my head), the same humor would not be present if I actually appeared at my son’s dorm door, spider in tow. In fact, I might be banned from the campus. Forever. And as far as the spider goes, it is much better off right where it is. I am sitting at the kitchen table finishing up some summer work when my daughter quietly comes down the stairs and approaches me. I look up at her. “Promise you won’t get mad,” she says as she holds out her hand. Her fist is closed, hiding whatever it is she has to give me. I study her face, not quite able to tell if she is kidding or serious. I hold out my hand, and she pauses a split second before she drops the tiniest nub of a light peach pencil in my palm. I gasp, feigning distress. I look at her, wide eyed. “You used up my peach pencil? ?” I ask. She had borrowed my colored pencils because I had the best ones—a tin of 36 Prismacolor pencils. Colored pencils—good, artist quality pencils—are not cheap. And drawing, painting, creating, this is how she chooses to relax and recharge. 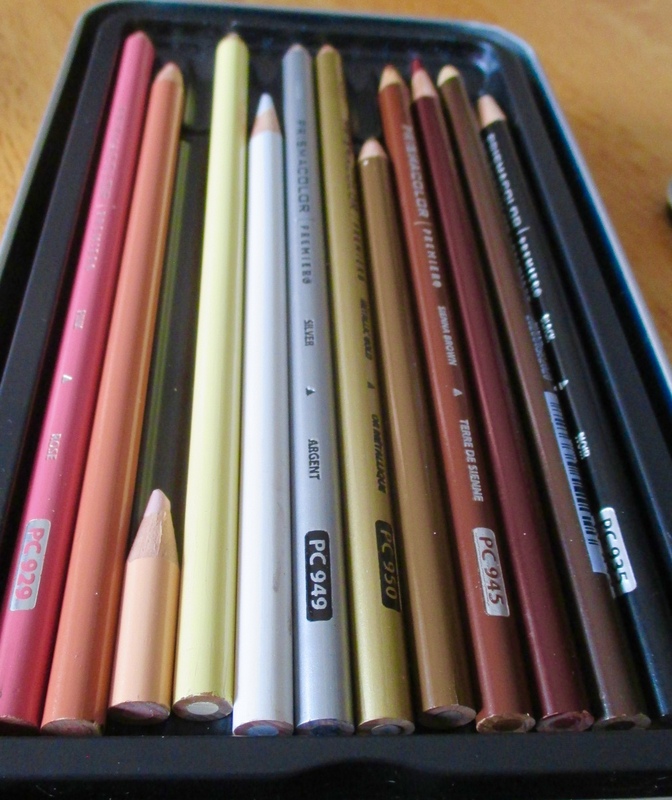 Of course, when she borrowed my pencils, I was well aware of the simple truth about “borrowing” art supplies. It’s not the same as borrowing, say, a musical instrument, because unlike borrowing a guitar, art supplies get used up in the borrowing. Next time I’m in the art supply store, I will stock up on light peach pencils. 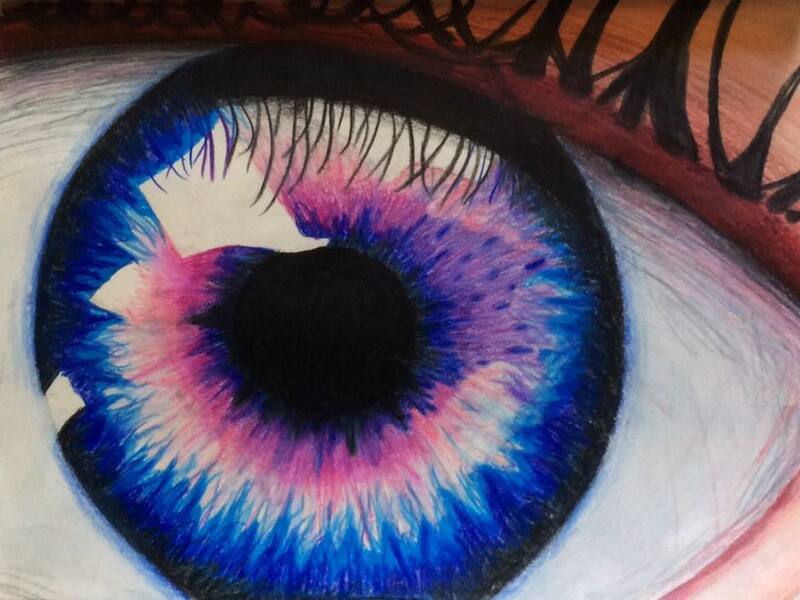 Because the truth is, I am more than fine with sacrificing my colored pencils in the name of amazing art.